It's Facebook Fridays! for October 16, 2015! Let the good times roll! 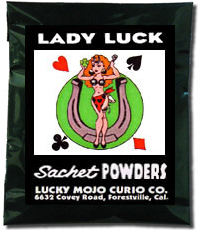 The Lucky Mojo Curio Company is holding a random drawing to give away 3 Lady Luck prize packs to bring in the winnings for gamblers and gamers, including 1 each of our hand-made Lady Luck Spiritual Supplies: Dressing Oil, Sachet Powders, Incense Powders, and Bath Crystals. First thing tomorrow morning, we will select THREE winners at random, announce their names here, and ask them to message this Facebook Page with their mailing addresses, so we can send them their FREE Lady Luck products. We have a winner! In fact, we have 3 lucky winners! Our Facebook Fridays! winners for October 16, 2015 are: Alysia GoRay, Heather Plunkett, and Crystal Purdie Passmore.